St. Louis flaunts the bold drama of the tropics in summer when blooming water lilies turn the reflecting pools at the Missouri Botanical Garden into spectacular exotica. Giant Victoria water lilies, with leaf spans of up to six feet, highlight the displays, which include hundreds of other aquatic plants in the pools by the Climatron® conservatory and the Linnean House. The lilies bloom from July through October, depending on the St. Louis weather, but their care begins long before that. In January, seeds of Victoria lilies are sown in pots of soil, which are submerged in 82 degree heated water in one of the 14 greenhouse tanks. Germination is tricky; it can take from one to four weeks. 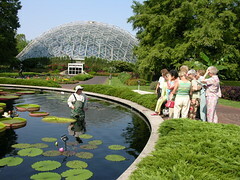 All the Nymphaea hybrid water lily cultivars are propagated from tubers according to methods developed at the Missouri Botanical Garden by George H. Pring, a prominent water lily expert and Missouri Botanical Garden horticulturist and superintendent from 1910 to 1963. The Garden produces on average 250 aquatic plants a year, including more than 50 different cultivars of Nymphaea with six or seven spectacular Victorias. Many of the giant lilies are the “Longwood Hybrid,” a cross between the Victoria amazonica and Victoria cruziana created at Longwood Gardens in Pennsylvania with the assistance of Pring. The “Longwood Hybrid” combines many of the great attributes of the two species. 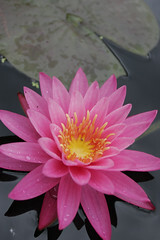 Victoria water lilies were first observed in Bolivia by the Bohemian botanist Thaddaeus Haenke in 1801. The French botanist Aime Bonpland observed Victoria in Argentina in 1819. He sent seeds and a full description to France in 1825. In 1836 the German born botanist Robert Schomburgk working under the direction of the English Royal Geographical Society found Victoria in British Guiana. He sent specimens and drawings back to Europe in 1837. From this data the English botanist John Lindley then established the genus Victoria and described the species regia in honor of Queen Victoria. The current nomenclature Victoria amazonica became the plant’s official name in the early part of the twentieth century. James Gurney was the gardener who grew and flowered Victoria for the first time at the Royal Botanic Gardens Kew in 1852 as well as at the Missouri Botanical Garden in 1894. Gurney was present when Queen Victoria came to visit the first flowering at Kew in 1852. Today the water lilies grace six unheated reflecting pools – three in front of the Linnean House and three between the Spink Pavilion and Climatron in an area known as the central axis. The pools on the central axis, built in 1917 and renovated in 1988-90, also showcase seven bronze sculptures by the late Swedish sculptor Carl Milles: Two Girls Dancing (1914-17), Sunglitter (1918), Orpheus Fountain Figures (Male and Female) (1936) and three angels with musical instruments in the center basin on the central axis. Victorias are delicate plants that crave the heat and humidity of the tropics. That makes them difficult to grow, since St. Louis cannot always supply their desired climate. Horticulturalists move the plants to the reflecting pools when the water temperature reaches 72 degrees. Plants grow in water from two to three feet deep. With the right conditions, the Victorias grow at an amazing rate, up to an inch an hour at their peak. Their night-blooming flowers can reach a diameter of 14 inches and are a creamy white color on opening the first night. The fragrance of the flowers tends to remind one of the tropics, with a combination of pineapple, oranges and jasmine. August is the prime viewing time. The best hours for visitors are mid-morning, when daytime blooms are opening and night bloomers close. 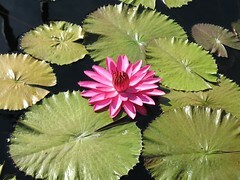 Day bloomers cover the color spectrum, and night bloomers are white, pink and red – the only colors that can be seen by night-flying insects which pollinate the lilies. The pool water is dyed black to provide reflection; mask any debris on the bottom; block the rays of the sun to reduce algae production; and to showcase the beauty of the flowers. Colorful spring and summer displays, including pansies, tulips and tropical plants, accent the tranquil reflecting pools. Volunteers help with the considerable maintenance required, including deadheading blooms weekly and fertilizing every seven to ten days by pushing tablets into the soil around the plant.